In our busy world of two-career families, commuting, daycare, fast food, after-school sports, there isn't much time left at the end of the day to spend quality time with children. The Empex Splash Park provides a much-needed retreat for the young family to get together and have some real fun teaching small tots the wonders of water flow or interacting with the older kids with splash battles and interactive water games. The CD30nx is a compact, wall-mounted system delivering ozonated water that inactivates 99.9 percent of harmful chlorine-resistant microorganisms. Designed with the industry's first on-board system information and diagnostics LCD display, which provides a seamless user interface to control and monitor ozone production and system diagnostics. UL approved, the CD30nx is designed to make ordering the properly sized package as simple as possible. You can turn your swimming pools into activity hubs with unique splash play options. Create engaging and fun spaces for all ages with unique aquatic play. All through the wonder of water. SR Waterpark scales are purpose-built to add an important element of safety for water thrill rides with prescribed weight limits. The red light/green light system provides ride operators with a convenient tool to quickly and decisively qualify riders, greatly reducing confrontations. Four sizes accommodate from one to six riders. Additional features include built-in or freestanding systems, upper and lower weight limits, can be used on multiple rides, user- and customer-friendly. Large or small, indoor or outdoor, novice or expert: WhiteWater's Body Slides have something for everyone. WhiteWater's designers have mastered the art of slide path design by creating custom-fit waterslides that deliver a full range of ride experiences. Tight fits, large structures, fast or slow, open or enclosed, WhiteWater can design and customize the ultimate waterslide to fit your needs and keep your guests smiling all day long. Multi Play structures are an excellent centerpiece for any pool or splash pad. Aquatic Recreation Company (ARC) offers many Multi Play structures in various sizes that are great for kids of any age. Multi Play structures combine many interactive water play elements into a single cost-effective structure to give kids a complete interactive experience. ARC's Multi Play structures are UV-resistant, durable, safe, simple to install and require minimal maintenance. 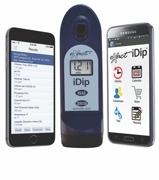 The eXact iDip® Photometer with Bluetooth® Smart technology is the first handheld photometer that pairs directly with a smartphone or tablet. It has the ability to test more than 45 water quality parameters through an ingeniously simple four-step process. Two-way wireless communication with Bluetooth® Smart (4.0) allows for instantaneous software updates and upgrades, market versatility and customization. Through the eXact iDip® App, testing location data and test results can be stored with its GPS-enabled feature, allowing for efficient data management and real-time sharing. Inter-Fab's Garden Ride™ Slide comes in three models with a simple two-piece design. Created to meet demand for custom slides that fit on smaller decks in park and rec pools, builders can now easily create waterpark-style slides for commercial aquatic facilities. Available in 7-foot, 10-foot and 15-foot lengths and perfect for upgrading pools while also offering creative landscaping opportunities. There are nine colors to choose from, including six stunning granite upgrade colors.